Miles Finer has good reasons not to believe in God. Or so he thinks. That’s what a tragedy can do to a person who measures God against prayer results. Never mind that his father is a pastor, it seems to Miles that God either doesn’t come through for us or he just isn’t there. The latter seems more plausible to him. 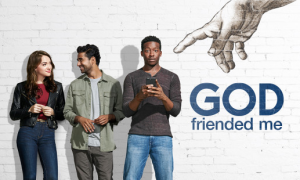 In God Friended Me, CBS’s newest sitcom, which debuts on Sunday, September 30 at 8 p.m. Eastern time, Miles is a podcaster making a name for himself by challenging God’s existence. Just as a big opportunity opens for him when SiriusXM asks him to submit an audition podcast, Miles gets a Facebook friend request from God. Yes, totally implausible, but also totally entertaining. I expected hokey, because seriously…a friend request from God? But after watching the pilot, I decided it was brilliant. Television plots aren’t documentaries, and yet, there’s a realness to it: human connectedness, coincidences, and healing emotional wounds. Once Miles finally accepts God’s friend request, God sends other friend requests from people whose lives Miles ends up having an impact on. It reminds me of the old TV series Touched by an Angel in which ran from 1994 to 2003 where an angel named Monica, played by Roma Downing, was tasked with bringing guidance and messages from heaven to people. The premise is different, but the plot is the same, God is present as we live out lives and guides us if we choose to work in union with him. Miles, (Brandon Michael Hall) helps Clara Bloom, a reporter (Violett Beane) find peace with her long-lost mother in the first episode. His friend Rakesh (Suraj Sharma) and sister Ali Finer (Javicia Leslie) are strong supporting actors that will be regulars in this series. Judging from the first episode, God Friended Me will make for good Sunday night viewing. There was one part, however, that I wish the producers would have left out. Rakesh gets set up by his mother with a date. The two of them go back to Mile’s apartment and it’s clear they did not keep their clothes on, not that they showed anything indecent. Too bad they had to put that in to an otherwise delightful show. The premiere is scheduled for Sept. 30, but the entire first one-hour episode is available here.